Pucker up for a cause! An awe-inspiring kid duo, supported by the likes of Forty Five Ten and SoulCycle, is feeding thousands with the sales of their fabulous Jingle Bell Mistletoe. Dallas’ own 11-year-old Stella Wrubel and Quinn Graves are returning to Highland Park Village to sell their Christmas creations for North Texas Food Bank. Stella, daughter of photographer Steve Wrubel and DJ Lucy Wrubel, started the fund-raiser in 2012 after Hurricane Sandy hit New York City. Last year, Quinn and Stella partnered with HP Village who matched the funds, helping raise more than $39,000 for the NTFB. Quinn and Stella are excited to return this December as the food bank’s “Youth Leaders of the Year.” In November, they were recognized at the annual Golden Fork Award ceremony for their stellar commitment to the Dallas community. In two years, Stella and Quinn have helped provide more than 168,000 meals in North Texas. 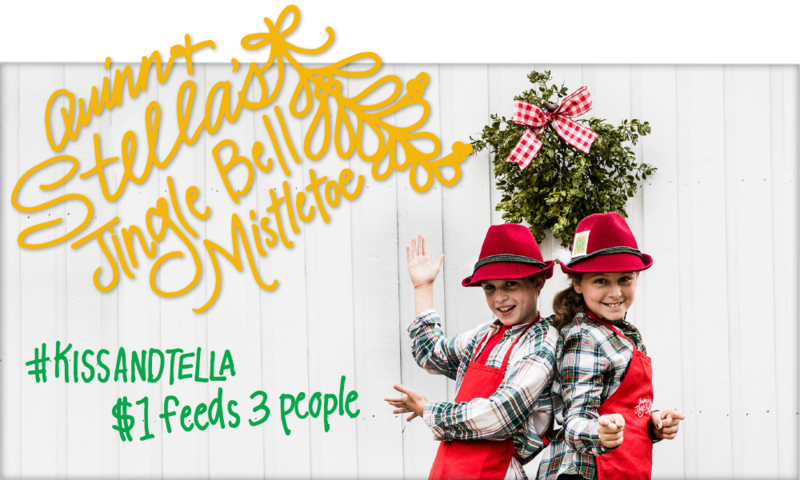 The Jingle Bell Mistletoe stand will be in Highland Park Village at Royal Blue Grocery from 2 to 4 pm, Friday, December 16 through Monday, December 19.